← More EQ2 bashing. Is it just me…? Update: To try and make this a little more accurate, I went to the official pages of EQ2 and LoTRO, and picked two SS, the first a scenery shot, the second a character shot. Since a nice discussion has started in the post below about EQ2 vs other games graphics, and I would like to try and keep the discussion to graphics only just to keep it focused if nothing else, I’ll just throw this up to keep things moving. The focus here is the ground. EQ2 is flat, boring, and lifeless. The LoTRO screen shot ground is full of detail, and bends in a natural way throughout the shot. It also just looks more ‘alive’ for lack of a better word. As I stated below, the reason this topic interests me is because I don’t think its close; I really think EQ2 is way below its peers in the graphics department. Clearly people disagree, which is great, and I really want people to bring up reasons why the look of EQ2 works for them. This entry was posted in EQ2, Lord of the Rings Online. Bookmark the permalink. 32 Responses to Screen shot comparison. You need to change the second screenshot link. I guessed “eq2.jpg” as the file name it it displayed correctly. Those are great. I’ve played LoTRO on max settings up to level 35ish before quiting. I fully plan to go back at some point. Actually this entire topic came to me when I randomly saw another blogger’s post with some LoTRO screens, and I realized how much better it looked than EQ2, and then I saw people stating they prefer the graphics of EQ2, which is why I started to question why. Not a fair comparison. The screenshot you provided for EQ2 is horrible. At least provide a good screenshot if you’re going to force the choice of which is better. If I still had an active EQ2 subscription I would happily provide dozens with better graphics. 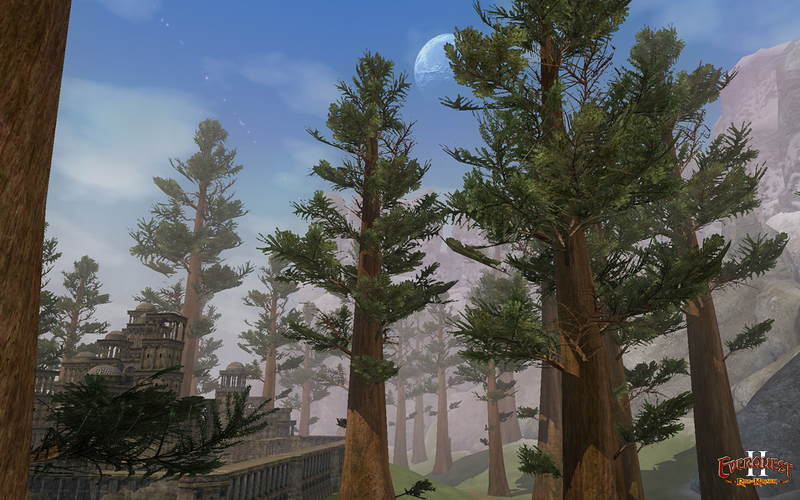 Get a screenshot with tree’s and grass in EQ2 – go to Faydwer. Grab some of the forests there and compare the tree graphics and the grass. As it stands now this is too bias. Just wanted to add some more to my claims. Look at the background for that EQ2 shot, look at the rock and the goat guy’s legs in the right. It’s as if your settings were on low in the EQ2 shot. I just grabbed both of those SS off the web, once I get home I’ll update the post with some of my own EQ2 and LoTRO (if I can find them) shots. Oh btw Keen, for some reason I can’t leave comments on your blog, using both Firefox and IE. When I hit submit, it just clears the comment field and does not post anything. Same thing happens with me on CommonSenseGamer. I think it’s the theme you guys use or something, not sure. Hmm.. you’ve posted comments on my blog before. I’ll see if I can figure out why. I ‘think’ it works from home, but not at work. Only reason I mention it is I often want to comment on some of the stuff you write, and can’t if I’m at work, which is when I do 90% of my blogging. Having worked closely with LOTRO since beta I can say with certainty that the character screenshot for LOTRO is not accurate – it’s doctored by Turbine no doubt. But knowing exactly what both games look like from having played them (on the highest possible settings), I can say I like the EQ2 scenery, the LOTRO character models, the EQ2 armor, the LOTRO weapons, and I’m split on the LOTRO/EQ2 mobs. Some look better from both sides. As for spell effects, since LOTRO has none really, EQ2 has the advantage on them. Totally manufactured example. 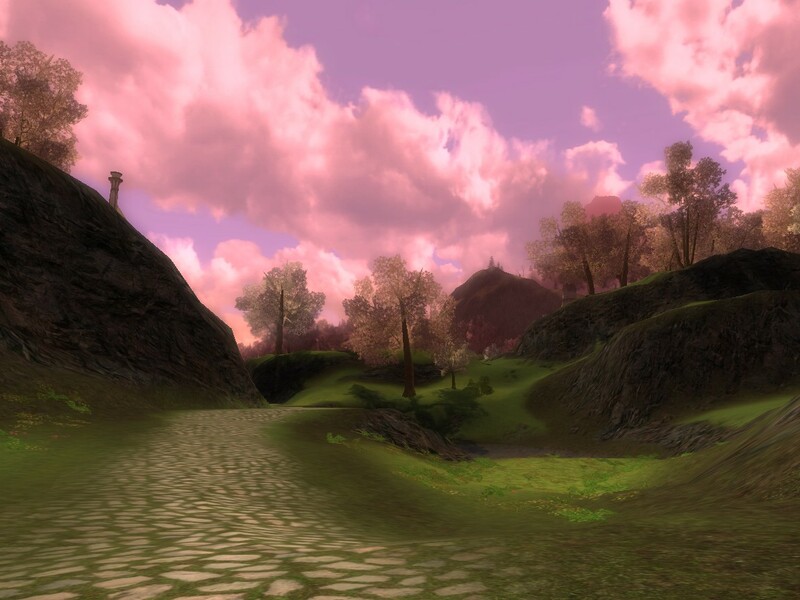 Plenty of places in LotRO that look bland and lifeless — Much of North Downs, nearly all of the Lone Lands — and plenty of places in EQ2 that look vibrant — anywhere in Greater or Lesser Fay… or in fact, anywhere in EoF; Feerott, Nektulos and Lavastorm in the old world — Neriak, Darklight Wood… I always thought North Freeport looked amazing, really a unique character to that city, while LotRO mostly reminded me of DAoC’s graphics. 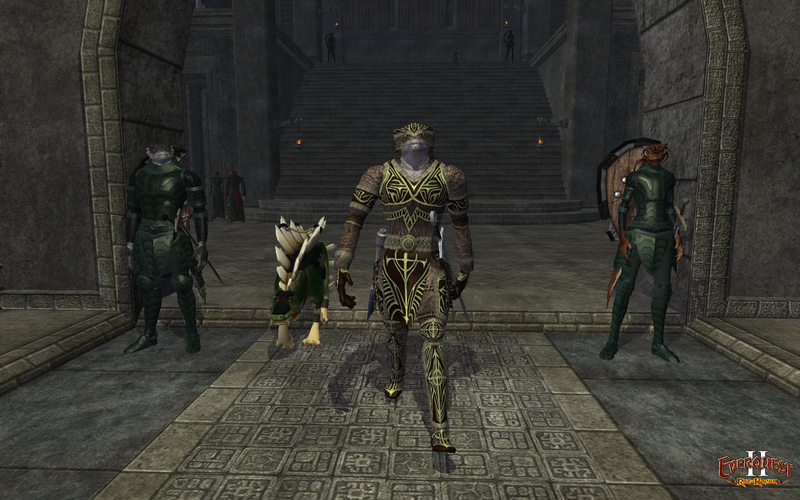 Here’s a screenshot I took during a Matron raid in EQ2. It’s from Mystic Lake. Vibrant colors. Lush vegetation (though it’s in the distance… didn’t take this screenie specifically to highlight the landscape). This is what EQ2 looks like on a slightly better than average setting. An average setting wouldn’t have shadows but would look pretty much the same. The picture of the Fae you have in New Tunaria was done at very low settings and it looks like the color range was squished somehow. New Tunaria is actually a beautiful zone and I would definitely put that next to any cityscape in LotRO if the pictures were the same quality. LotRO at medium settings always made Bree a slideshow for me. I don’t know Keen, my SS that I have of LoTRO, while not great examples for what I was getting at here, look almost identical to the ones off the website, minus the camera angles. Maybe if I matched them up and had them both up on the same screen I could pick out some differences, but again fairly close if not identical. As for the example being manufactured Tipa, both sets of SS are off the official sites, so unless SoE wants to show off EQ in a negative light, I would say its a fair comparison. I think the most striking one is the landscape comparison. The RoK SS just looks incredible dull to me, almost like the colors are washed. A few trees scattered around with nothing between them, and a non-descript temple/ruin. Compare that to the LoTRO shot, with the full vegetation, rolling landscape, visible yet natural elevation changes. I do agree the first SS of EQ I put up seems odd, so we can throw that one out. Very simple answer to why your graphics on the LoTRO looks better than EQ2’s. 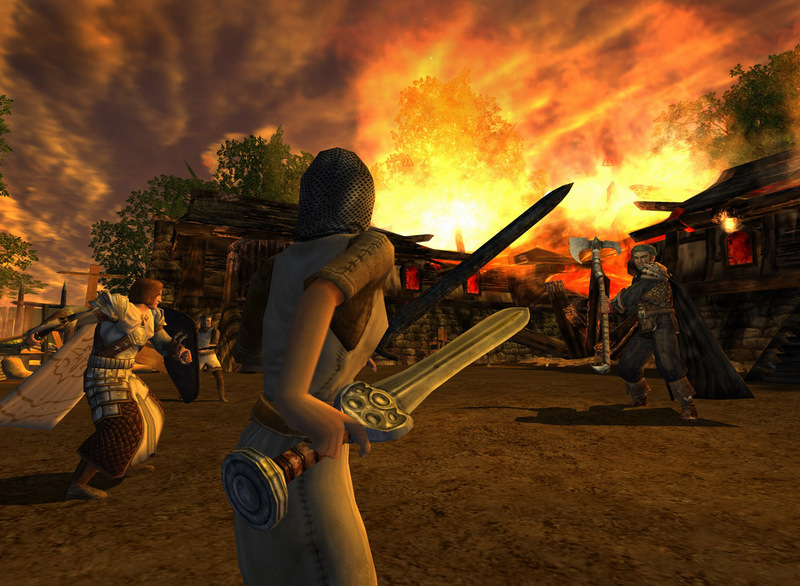 You have the graphics turned way down in the EverQuest II screenshot. If you took the screen off a website, then you need to actually play the game and see what the terrain and world looks like. One can not base an arguement without proper documentation and information to back up their side of the story. To say that EQ2 is a bland land is simply describing it as it is. With the Shire and Bree, you have an idea of how they should be from the books. What you see in the game is an excellent representation of that idea. What you see in EQ2 is what they want those lands to be. Whose to say that the Commonlands are not supposed to be how they are. There was a battle there. That said, I do miss some of the awesome grass and flowers I saw in Middle Earth and I think tonight I am going to bump up the graphics in EQ2 and head over to Antonica and see how she looks. I have yet to move my settings off balanced. You can get swaying grass and flowers in EQ2 but it s-l-o-w-s you down so much that I only turn them on for screenshots where I don’t plan on moving much. I have some problems with EQ2’s graphics — they try to be realistic, and sometimes I have to wonder why they consider realism that important in a fantasy game? WoW went for “storybook” graphics, EQ2 for realism. Though they bought a new set of crayons for Faydwer, edged a little into the fantastic. I hope they keep that in mind for Kunark. EQ2 has graphics just as good as LotRO. I’ve played both games. I took a lot of really good screenshots for LotRO, but in the end I left LotRO because of a billing error, and it had nothing to do with a comparison of EQ2 and LotRO graphics. Now, you can (and do) compare the overall art direction of both games, and that’s totally legit. LotRO areas definitely seem more painted, though there’s few vistas in EQ2 that are as ugly as ND or LL in LotRO. Still, there’s few as beautiful as the Shire or Ered Luin, either. That said, the more primitive graphics of UO, EQ1, AC and DAoC didn’t stop people from having (and continuing to have, in every case) years of fun in those games. So even if every single person agreed that LotRO graphics were better in every way than EQ2 graphics, would that alone make LotRO the better game? Oh I fully agree Tipa, the graphics don’t make the game, it was just a tangent I got on after seeing Justin’s post. Also a good point about the ‘painted’ look, thats a good way of looking at it. I guess I just prefer that style so greatly over what EQ is trying to do that it borders on me thinking EQ is technically inferior, when perhaps it is a simple case of using what you have in very different ways. The flower sway thing is also mind boggling, why is it even an option? It literally brings my FPS from 30+ to 5ish. Either its terribly implemented, or it does some amazing things if you could get it above 5 FPS. Either way, very odd feature. Just to clarify, I have played both games; LoTRO runs on Very High for me, EQ runs on I believe High (or whatever the 2nd highest setting is called). I must admit I have not tweeked EQ2 much, as the graphical options are a little arcane, and I’m not into the game enough to really spend a long time trying to get it to optimal settings. That said, if anyone has a few settings they feel are absolute musts, for both looks and performance, please share them. Oh one more thing, and this might again just be my settings, but any character outside 20 feet or so goes into what looks like an alternate, low quality model, and only when I get closer does it load up the much better looking version. Is there a way to increase this distance, without bringing the game to a halt? Oh, yeah I must admit that EQ2 version graphics is somewhat dull, lifeless and when it comes to the landscape, choppier than other games I know (In addition, visual altering is very big between high performance and extreme quality). But, there’s certain number of reasons why I love EQ2 graphics. Actually I can’t say for more specific because I’m not a veteran of EQ2 and I just don’t mention that “Wow this game’s graphics is very gorgeous” when the game has – in fact – very ugly visual, however, I think this matter won’t be going away soon enough. 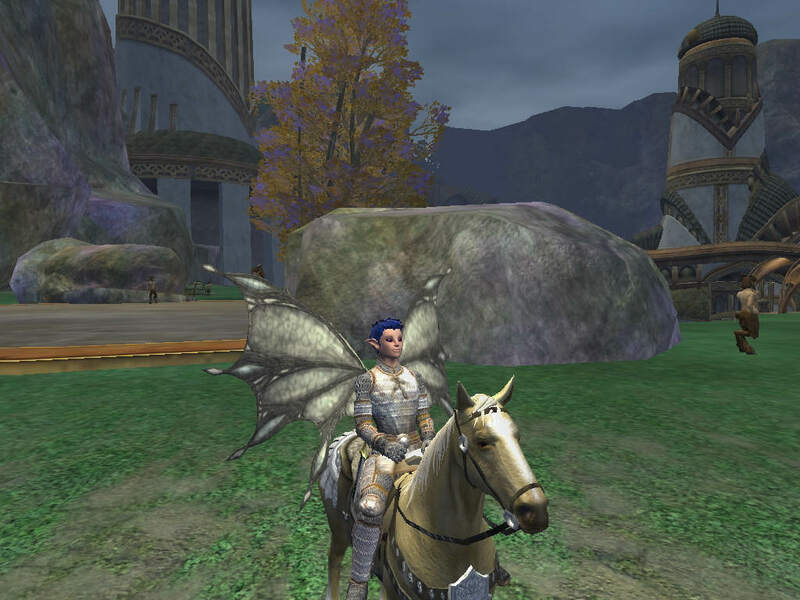 Pingback: West Karana » EQ2 Screenshot Throwdown! I’m going to have to agree with some of you – the comparison is far from fair. The LOTR shot has fauna turned on while the EQ2 shot does not, and I can guarantee you is not an optimal shot of EQ2 nor is it running on optimal graphics. The green you see on the ground in the New Tunaria shot is moss on stone — it doesn’t grow high no matter what your graphics settings. Other zones have bunches of grass when you turn it on in the options panel but really, it slows stuff down for no reason. I never have it on. This made me laugh so bad..it hurt. This screenshot comparison was the worst example of comparing I have seen anywhere. I left LOTRO 2 months ago, and started playing EQ2..so, I am new to it…and I have an 8800GTS…this is a big telling sign…why? The graphics in EQ2 are WAY better than LOTRO with this card…the landscapes are superb…but not just that…if you use the SOGA models in EQ2…the characters BLOW AWAY LOTRO also..
Again, the top screen shots are taken from the OFFICIAL sites for both games. Blame SoE for taking lousy screen shots if you want, but those are the ones they put up. And Ray, EQ2 won’t run at extreme setting on your comp at 1900×1200 in all areas, I’m sorry but there is simply no way. Even with a 8800 Ultra it won’t, mainly because EQ2 is mostly limited by the CPU, and no CPU on the market is able to run it at extreme. That’s simply not the case with LoTRO, a powerful rig will have no issues running LoTRO at max. Going a bit further, even the extreme setting in EQ2 does not by default enable the ‘grass movement’ option, as that feature is so badly broken it’s a joke. Hate to break it to ya Syn, but i am running EQ2 at 1900×1200 with all setting at max and all options turned on without any issues such as slowdown (cept in Neriak), and that is on an SLI 7950 rig. It most definately is possible. What FPS are you getting, on average? And what about in a raid? Perhaps you have some magic combination of hardware the perfectly suits EQ2, which is certainly possible, but I’m not the only one with a rig far above the hardware needed for EQ that has had issues. BTW, have you ever played NWN2, and if so, any issues with that? I ask simply because I have considered getting a 7950 as a stop-gap to hold me over until the next gen cards are out, and because I think my 7900 GTX has some minor issues. LOTR is newer. It uses a newer graphics engine. 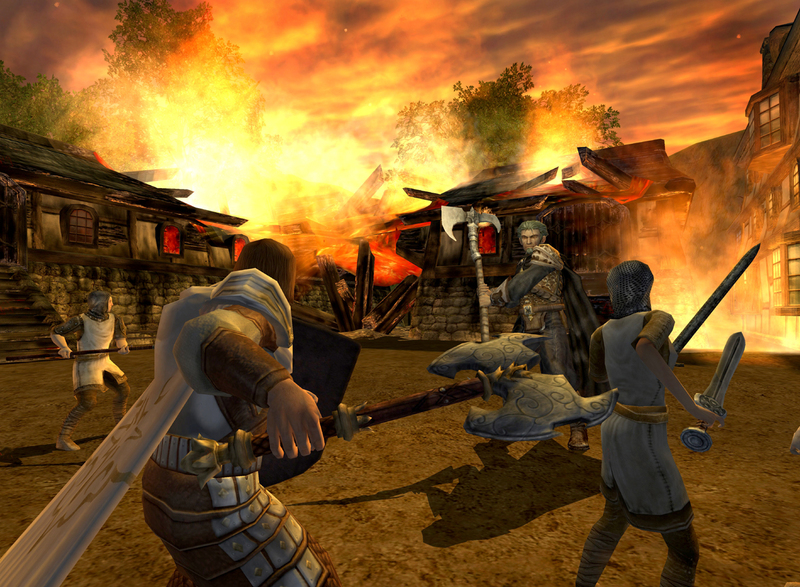 EQ2 has been using the same graphics engine since beta over 8 years ago. I wouldn’t be surprised. However, they are consistently revamping and adding new content to the game, updating zone textures as well as armor textures and alternate character models with increased resolution textures.